Course Description — Students will study chemistry and physics through experimentation, demonstration, readings, videos and a variety of online activities. They will learn about the periodic table and many of the elements, studying their structure and use. Students will model the structure of atoms and molecules and will explore the states of matter, discovering the properties of solids, liquids and gases. They will create and observe different types of chemical reactions and experiment with acids and bases. Physics topics include: light, sound, aerodynamics, forces, the Three Laws of Motion, energy, heat, electricity, magnetism, simple machines and engineering. Students will learn but also apply their learning by building a roller coaster, bridge and dome as well as circuits and solar oven. Consider buying goggles and rubber gloves (disposable gloves they use in hospitals). The most dangerous thing they will be using household cleaners, but they are chemicals and it would be good to be protected against splashes and spills as well as to build a good habit. These are the worksheets you are asked to print out throughout the year, including the optional worksheets. Use the pictures to buy the workbook. Use the links to print the workbook for yourself. You can also print the worksheets as you need them throughout the year. Take a small piece of aluminum foil. Rip it in half. Again. And again and again and again until you can’t any more. If you could keep ripping it until it was the smallest piece of aluminum in the world, that would be an atom, an aluminum atom. Everything in the world is made up of atoms. Different types of atoms come together in different combinations called molecules to make up everything you see in the world. Atoms are so small that five million hydrogen atoms would fit on the head of a pin. That’s 5,000,000 atoms. *Print out Elements Lapbook (M is using this too). You will work on this throughout the year. Cut out H piece. You’re going to compile these throughout the year. You can use a poster board, individual pages by family group, or any other way you’d like to organize them. If you organize them in groups, the Hydrogen piece would be in the alkali metals group. Take a small piece of aluminum foil. Rip it in half. Again. And again and again and again until you can’t any more. If you could keep ripping it until it was the smallest piece of aluminum in the world, that would be an atom, an aluminum atom. Everything in the world is made up of atoms, or atoms make up the matter that everything is made of. Different types of atoms come together in different combinations called molecules to make up everything you see in the world. *Print out Elements Lapbook (L is using this too) Cut out H piece. You’re going to compile these throughout the year. You can use a poster board, individual pages by family group, or any other way you’d like to organize them. If you organize them in groups, the Hydrogen piece would be in the alkali metals group. (*)Here is a periodic table to look at or to print out in color with picture examples. (Print it out if you can and put it in your notebook.) This is called the periodic table of elements. Each box is one element. Everything in the world, including you, is made up of these elements. They are listed on this table in order of their weights. Number one is hydrogen. It is a gas. It is the lightest element. Draw a picture or write about hydrogen inside booklet and add it to your Alkalai Metals Group lapbook page. Fill in Hydrogen booklet. Need an idea of what to put inside about hydrogen? Read this. Do first mystery interactive about the disappearing city. Stop when it starts second mystery. What do you think happens to a city when the train goes through town? What do you think happens to a city if the train passes it by and doesn’t take people there? Here’s a video on how steam engines work. Tell someone what makes a steam engine work. Watch video about how steam engines work. Watch this animation of steam engines. Explain how a steam engine works. Draw a diagram of the inside of a steam engine. Color where the water is blue. Color where the steam is red. Include a firebox, boiler and steam box. If you don’t remember, go back to yesterday’s mystery railroad lesson. Watch and read about steam engines. Draw a diagram of how it works and explain it to someone. Copy this sentence about steam engines and tell what it means in your own words. What makes water turn into steam? Click on states of matter. Click on solid, liquid, and gas to view what it looks like in each state. Imagine those blue balls are water. When water is a solid, it is ice. When it’s a gas, it’s steam. What turns water you can drink into steam? Just about everything you see in this world is a solid, a liquid or a gas. A desk is a solid; a liquid is milk; a gas is helium in balloons that float. *Print out page 1 of this worksheet on solids, liquids and gases and fill it in. Make sure you put it in your notebook. You can check your answers on page 2. Tell a parent or an older sibling what you think makes something a solid, a liquid or a gas. What makes water turn into steam? Click on states. *Print out this worksheet on water changing and fill in. The answers are on page 2. Make sure you put it in your notebook. You just learned that by changing the temperature of a type of matter you can change its state. For example by heating the solid ice you change it into a liquid. Bell realized that the sound carried better if he used a liquid with his thin metal wire. Conduct a sound experiment. Does sound travel better through a solid or a gas (the air)? Do Table Thunder, the second experiment. Try it a few times with different tables. If you can get what you need together, you could do any of the other experiments too. In your science notebook, describe your experiment and what your conclusion is. Your conclusion is your answer, does sound travel better through a solid or a gas? Think of a way to test if sound travels better through a liquid or a gas? Try it. What’s your result? Present your conclusions at the dinner table. *Bell realized that the sound carried better if he used a liquid. Conduct a sound experiment. Does sound travel better through a solid or a gas (the air)? Do Hang In There. Try it a few times with different tables. If you can get what you need together, you could do any of the other experiments too. Print out the science experiment page and fill it out with your experiment details. I wrote the experiment question above. Experiment worksheet Think of a way to test if sound travels better through a liquid or a gas? Try it. What’s your result? Present your conclusions from today’s experiments at the dinner table. Read about how a telephone works. Click on Next Page when you get to the bottom. And again on the next page. On this page, after you read, click on the image to see it animated. Just a reminder not to click on anything else on these pages. The advertisements are just to get your money. They will not improve your life 🙂 Have self-control and stay focused. Describe how Alexander Graham Bell’s telephone worked. Cut out your O element booklet. Oxygen is part of what we breathe. We need oxygen for our bodies to work. It is another element in our world and is number 8 on the periodic table because one atom of oxygen has 8 protons in it. We’ll learn later about protons. Write or draw inside your oxygen card. Add it to your Oxygen Group lapbook page. Not everything in the world is hydrogen or oxygen or carbon or whatever else is on the periodic table. Those are the elements that other things are made from. When different atoms come together to make something new, they are called molecules. Probably the most famous molecule is H2O. Have you ever heard of it? It means two hydrogen atoms and one oxygen atom getting together. When they do, they make water! All water you see are H2O molecules. Here’s a picture of a water molecule. Draw a water molecule and label the three parts each either H or O. Label your picture and keep it in your science notebook. Look at other molecules. Choose Real Molecules. Then you can choose different ones from the menu. You can also reload and choose Model and build fake molecules just for fun, if you like. Cut out your O element booklet. Oxygen is part of what we breathe. We need oxygen for our bodies to work. It is another element in our world and is number 8 on the periodic table because one atom of oxygen has 8 protons in it. We’ll learn later about protons. Write or draw inside your oxygen card. Not everything in the world is hydrogen or oxygen or carbon or whatever else is on the periodic table. Those are the elements that other things are made from. When different atoms come together to make something new, they are called molecules. Probably the most famous molecule is H2O. Have you ever heard of it? It means two hydrogen atoms and one oxygen atom getting together. When they do, they make water! All water you see is made up of H2O molecules. Here’s a picture of a water molecule. Remember molecules? A water molecule is made up of two hydrogen atoms and one oxygen atom, H2O. When molecules heat up, they get really excited and move around a lot! That’s a gas. When molecules cool down enough, they barely move at all; that’s a solid. Read about solids, liquids and gases. Then try the game at the BOTTOM of the page. Read about freezing and melting and then do the activity at the BOTTOM of the page. Read about evaporation and condensation and then do the activity below the reading. Read about the water cycle and do the activity below the reading. Do this activity with states of matter. If you have a grape and a microwave, then you can create plasma. Plasma is another state of matter. It’s what you get when you excite molecules even more than in a gaseous state. Make sure you have parent permission AND supervision before you do this! Turn the microwave on and be ready to turn it off. In 10-15 seconds you should see plasma shooting off the grape! Turn off your microwave after those 10-15 seconds. Don’t let the grape cook longer. If you don’t have a microwave, you can watch a video of the experiment. We’ve been learning about atoms, which make up the elements everything in our world is made up of. When atoms are combined, it is called a molecule. When molecules heat up, they get excited and move around a lot. This is what happens when water turns into water vapor (or steam). When molecules cool down, they slow down to mostly stopped. This is what happens when water turns into ice. Ice, water and steam are all H2O. They are all made of water molecules. It is the same matter. They are just each in a different state of matter. Watch the molecules get excited. Heat them up. Write in your science notebook each of the words in bold. As best you can write what you can about what each means. *Fill in the definitions of the terms on this worksheet. As a reward for your hard work writing great definitions, here’s a video of what fun chemistry can be. Another way to move molecules, other than to excite them by heating them up, is to cause them to vibrate. When there is a sound, it moves the molecules in the air, causing them to vibrate. They start crashing into other molecules and make them vibrate too and those crash into the molecules next to them so that they start vibrating and that’s how sound travels from one place to another. Make a sound wave. Tie a strong string to a doorknob and walk back until the string is straight or take the plug of your vacuum cleaner in your hand and stretch out the cord. Move your arm up and down and send waves down the string or cord. That’s how sound travels, in waves. Draw sound waves in your notebook. Write in your science notebook what you learned from the experiment. Please put the date at the top of the page. Explore sound in your house. What makes sound? What is being vibrated to make the sound? Remember that sound can travel through a gas, a liquid or a solid. When you listened to the bang on the table, it was the molecules in the table vibrating. Make a list of your observations to the two questions as you explore your house. Play with different instruments to make different sounds. What is being vibrated to make each sound? You need to drag the different instruments onto the screen to play them. You can also do the sound sorting activity. Try filling glasses up with water to different heights. Which gives a higher sound? The one with the least amount of water because the molecules can vibrate back and forth through it faster. If you have a bottle that you can blow over the opening to make a sound, fill the bottle with different amounts of water. It will produce a higher sound if you have more water (because there is less air) and the molecules can vibrate back and forth through the smaller amount of air faster, making the sound higher. Record in your science notebook the different ways you vibrated molecules to create sound. Please write the date on the page. Watch vibrations caused by sound. Skip to 1 minute. This is a mixture of cornstarch and water on a cookie sheet sitting on top of a speaker. Watch this video of sound experiments and then figure out some of your own special effects sounds. What sounds can you make with things around your house? Roll up as large a piece of paper as you can find into a cone shape. Leave a little opening at the end. Talk regular into the air and then through your cone. What’s the difference? Listen to someone talking regularly and then with the small opening of the cone to your ear. What’s the difference? Your cone is spreading out and collecting sound waves. Fill in your science experiment worksheet. Question: Can sound waves be amplified (made louder)? Read about the speed of sound and traveling faster than the speed of sound. Watch a video about breaking the sound barrier. Then listen to a plane breaking the sound barrier. Read about the phonograph. Here’s a picture of an original. Draw a phonograph. What is being vibrated. If you have a record player at your house, observe it in action. Watch the Edison Phonograph video. While records are flat, Edison’s played from grooves in a spinning cylinder. It starts playing at :45. If you have a record player at home, observe it in use. You can also watch the video. While records are flat, Edison’s played from grooves in a spinning cylinder. Draw a diagram of how a phonograph works. Let’s learn a little more about light and the light bulb. The light in the bulb basically is a fine wire, called a filament, that gives off light because it is heated up and gets hot. It’s actually atoms that are giving off light. Remember how they get excited when they heat up? The electricity travels into the bulb, heats up the atoms in the filament, causes them to jump around which gives off the light. To make the bulb shine as it does, it is filled with a gas to help it. The gas is called argon. Watch the video below on how a light bulb is made in a factory today. Then cut out argon booklet. Draw or write inside it and add it to your Noble Gases lapbook page. The light in a bulb basically is a fine wire, called a filament, that gives off light because it is heated up and gets hot. It’s actually atoms that are giving off light. Remember how they get excited when they heat up? The electricity travels into the bulb, heats up the atoms in the filament, causes them to jump around which gives off the light. Watch video on argon. Argon is the gas used in most light bulbs. Thomas Edison learned that leaving air in the bulb would cause the filament (the thin carbon wire inside) to burn up. He used a vacuum to take out the air. Now we remove the air and put in argon. Read about the group of noble gases. Cut out and fill in your argon piece. Do this activity about light. *Draw on this worksheet to show how light travels to an object and then reflects to our eyes. You can check your answers on page 2. We see because light travels from the light source to an object, reflects off that object and hits our eye. Watch this video about how light travels. Click on the simple activity at the bottom of the page and fill in the blanks. Here’s another demonstration of how light travels. You’ve learned that light travels in a straight line. You’ve also learned that you can change the direction that light travels by reflecting it. Take a hand-held mirror (or something else reflective–watches and rings might work) and find a light to reflect. Make a light dance around the ceiling by reflecting it off your mirror. Get a glass of water. Use a clear glass if you can so you can see inside well. Place a pencil or straw inside the cup. Does it look the pencil is bent? The light bends when it hits the surface of the water. It doesn’t stop the light like a wall does, but it bends it enough to send a bent reflection back to our eyes. *Write up an experiment worksheet. Question: Can light bend? Watch this video about how light bends and slows. Get a metal spoon. Look at yourself in it. Turn it over. What do you observe? Remember, what you see is the light reflecting off of something. Because the top of the spoon is curved down the light bounces off and heads down, so we see our forehead at the bottom. The light that hits the bottom part is bounced up by the curve, so we see our chins at the top. On the other side we see ourselves stretched out. Why? In what direction does the light bounce? Draw a picture of light hitting a spoon from both sides. Where does the light bounce to? Read this page about reflection. Read this page about light refraction. Place a glass of water on the end of a white sheet of paper near a sunny window. Let the light shine through the water. What do you see on the paper? Light is made up of colors. The light waves of different colors travel at different speeds and so bend in different ways going through the water. The water demonstrates light refraction, the change in direction due to a change in speed. The water slows the light waves and causes them to bend. Play with this color mixer. Select “RGB Bulbs” option. Use the sliders to adjust the amount of light from each color bulb. Make sure you observe mixing all three at their highest levels. You can see how light is white, but it is really made up of many colors. Because of what we know about how our eyes see light and how our brains receive those signals, people have developed many optical illusions. We think we see what we don’t see. Want to see? Here is one. The pictures on the right and the left are the same. The blocks A and B are the same color. Read about the structure of a light bulb. The “electrical foot contact” is what conducts, or carries, the electricity into the bulb. Play this game to experiment with different conductors and receivers. Play this electrical circuit game. Write circuit, conduct and filament in your science notebook and write definitions for the words. EXTRA — if you want to and are able to… How to make a periscope. *Print out page ONE of this worksheet on atoms. Watch the video on atoms and molecules. It’s okay if you don’t understand everything. Fill in the blanks on the worksheet. You can check your answers on page 2. Draw a Hydrogen atom. It’s the simplest one. It is number 1 on the periodic table so it has one proton and one electron. It doesn’t have any neutrons. Draw a circle for the nucleus and a + sign inside of it for your proton. Draw a circle around that for your electron to travel on. Draw a – sign for your electron on that circle. *Watch this video and take notes of any new vocabulary. When you hear a new word, jot it down on the top of page 1 of this worksheet. After the video is done fill in more about each word you wrote down. Also write in your notes the explanation as to why atoms join together. Watch it again if you can’t remember! Fill in the bottom of your worksheet. Keep it in your science notebook. You can check the answers on page 2. With adult permission and help heat one cup of water on the stove and add three cups of sugar. Add a little at a time, stirring to dissolve. You are making a saturated solution — so full it can’t take in any more sugar. When it is all dissolved, pour it into a clean jar. Tie a string to the middle of a pencil. Tie a paper clip to the other end. Make sure the string is short enough so that the paper clip doesn’t touch the bottom of the jar. (You don’t want it to touch the sides either.) Lay the pencil across the top of the jar so that the paper clip and string hang in the liquid. Let it sit a few days and watch the sugar crystals grow. 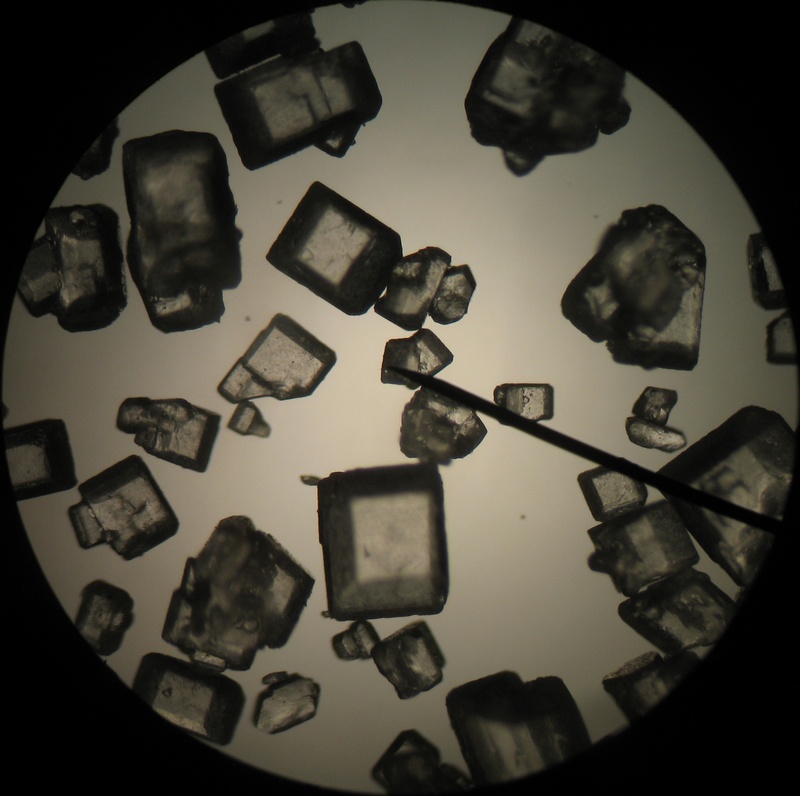 The sugar crystals are just sugar molecules attaching together. Look at this picture of enormous crystals. Epsom salt is magnesium sulfate, MgSO4 That means that each molecule of magnesium sulfate is made up of one atom of magnesium, one atom of sulfur and 4 atoms of oxygen. The crystals are lots and lots of molecules joining together. Draw a picture of what a magnesium atom might look like. It is number 12 on the periodic table so it has 12 protons and electrons. Draw a nucleus with 12 + signs in it for the protons. Now draw a ring around it with two electrons (-) on it. That’s all the first level can hold. Now draw a second ring around that. The second level can hold 8 electrons, remember? Draw eight electrons on the second ring. That’s 10 electrons. Now draw a third ring around the atom. How many electrons should you draw on this one? It needs 12 and you’ve only drawn 10 so far. This last level or its valence shell needs 2 more drawn in, but it wants 18! That’s why it will bond with the other atoms. The next element on the periodic table you will work on is helium. Helium is a gas. You may have heard of helium balloons. Those balloons that float away if you let go of them are filled with helium. They float because they are lighter than air. Remember the lighter the element, the earlier it is on the chart. Helium is number 2. So if helium floats, do you think hydrogen balloons float too? Of course! Hydrogen is lighter than helium. That’s why it is number 1 on the chart. So helium is number 2 on our periodic table. That means it has 2 protons in its nucleus, center. That means it also has 2 electrons flying around it. Cut out helium piece. Write or draw inside about helium. You could also draw a helium atom inside. Add it to your Noble Gases lapbook page. Watch the video on helium. Helium is number 2 on the periodic table because it has 2 protons. Check out this site on helium. Use the different links on the right. Cut out the helium piece. Write inside about helium. Draw a helium atom inside as well. Helium belongs to the group of noble gases. Every element in a group has the same number of electrons in its valence shell, except for helium, which only has 2. How many electrons do they each have in their valence shell? Use neon to figure it out. How many are in it’s outer shell? First shell 2, second shell 8, right? Now check it with argon, number 18. Does it work? Remember argon? It’s what is put in regular light bulbs. *Fill in this chart for helium (just print page 1). We know that the atomic number is 2. We also know that the atomic number is also the number of protons. Fill in that information on your chart. Periodic table charts tell us that its atomic mass is 4.002602. Fill that number in. Its mass number is 4. Now protons are the positive charge in the nucleus. There has to be an even negative charge to balance it out. That means there the same number of electrons (the negative) as protons (the positive). Fill in the number of electrons on your chart. Now to find the neutrons take the mass number and subtract the number of protons to see what’s left over. So in this case 4-2=2. There are 2 neutrons in a helium atom. Fill in the number of neutrons on your chart. Take your coin collection (all the same coin) and lay them flat on a table and push them together so that they are all the way touching. Look for patterns. Do you see how they line up? Do you see how they surround each other in the same shape even though you put them together randomly? *Print out and complete page 1 of this worksheet. You can check your answers on page 2. Do you remember seeing this in the video from Day 21? We’ve looked a little at how molecules bond together. Let’s do an experiment to watch it in action. Fill a cup with water to the very top. Guess how many coins you’ll be able to drop in before it spills. Start dropping in coins (or something else). How many did you get in? What is holding the water in place is called surface tension. What’s happening is that the water molecules on top are attracted to the water molecules under them and cling to them. Write “surface tension” in your notebook and explain what it is. *Print and complete page 1 of this worksheet. You can check your answers on page 2. Want to watch molecules attract again? Get a bowl milk. Sprinkle in a hand full of O shaped cereal or ball-shaped cereal. Do they race towards each other and touch each other? This is a big picture of how molecules attract each other. Now let’s watch molecules repel or run away from each other. Pour a spoonful of water into a bowl. Add food coloring if you like. Add drops of oil to the water. What happens? The water seems to run away. What is happening is that the water molecules are attracted to the water molecules and the oil molecules are attracted to the oil molecules, so they stay separate. Add some dish detergent. What happens? The water and oil molecules are both attracted to the dish detergent molecules. That’s how grease gets off your dishes and into the water. Draw a picture of molecules attracting. Fill a tablespoon with water. Fill the tablespoon so that the water seems to mound up over the top of the spoon. Why doesn’t the water spill over? Cohesion. The molecules on top are attracted to those underneath and hold onto each other. This creates surface tension. Fill a cup with water. Place a paper clip or pin on top of the water. It’s heavier than water, but it floats. Why? The cohesion builds up a strong surface tension. It holds the water in place and the paper clip on top. (*) Print out this water cohesion notebooking page or just use your notebook, and write why a too full cup of water doesn’t spill. Make sure you start with an introduction sentence that says what you are going to write about. (Example: Did you ever wonder why you can fill a cup to the brim and it doesn’t spill?) Use all the words/phrases listed. Read about carbon. It’s another element that makes up our world. Cut out your carbon piece and write or draw about carbon. Add it to your Carbon Group lapbook page. Watch this video on carbon. Cut out your carbon piece and write about carbon inside. We’ve talked about water molecules being attracted and repelled and getting exciting by heat and turning into steam, etc. But it’s not just water molecules that get excited or attract other molecules, etc. Let’s do an experiment that shows how the molecules are changing. You just witnessed a chemical reaction, or a change in a chemical. Explain the chemical reaction in this experiment. Here’s the video of the experiment if you can’t do it. Want to check out my son’s MoonScrapers? We’ve talked about water molecules bonding and being attracted and getting exciting by heat and turning into steam, etc. But all molecules do these things. If you have younger siblings, they’re doing this experiment today too. Put vinegar in a small bottle, like a drinking water bottle. Fill it up halfway or at least get a significant amount in there. If you just have a small balloon, you’ll need less. Put two tablespoons of baking soda into the balloon. A funnel would be an easy way to do that. Without spilling any baking soda into the bottle, stretch the balloon opening over the bottle opening and let the balloon hang down to one side. Ready? Take hold of the top of the balloon and hold it up so that all of the baking soda falls into the bottle. What happens? The molecules in the baking soda (NaHCO3) and the molecules in the vinegar (CH3COOH) react together. They atoms bond in different ways. Look at those molecules. They are more complicated than H2O, but it is the same idea. The atoms, the hydrogen, the oxygen, etc. find new ways to bond, or come together, once added with different types of molecules. Look at the baking soda molecule. 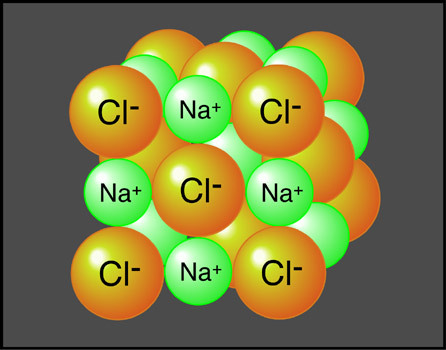 The Na (sodium) gets separated. An H (hydrogen) from the vinegar joins with the H in the baking soda and steals an O (oxygen). That makes H2O, right? That leaves CO2. CO2 is carbon dioxide. That’s the gas that is filling your balloon and is also what’s making the fizzing and bubbling. This is called a chemical reaction, or simply a change in a chemical. Chemical reactions can be described by chemical equations. We’re not going to be working with these. I just want you to take a look at one for this experiment. (*)Explain the chemical reaction in this experiment. You can use this notebooking page if you’d like. Let’s look at another chemical reaction. Fill a glass halfway with seltzer water. (If you don’t have what our family calls, “bubble water,” then just use regular water. The reaction just takes a bit longer. Add a drop of food coloring. Pour in bleach and watch the color disappear. The color disappears because the oxygen molecules in the bleach and the oxygen molecules in the water bond together. If you can’t do it yourself, watch the video. Watch this video of a neat chemical reaction. This is sulfuric acid being poured into sugar. The acid reacts with the sugar and takes all the H2O out of the sugar. That leaves only carbon! Write chemical reaction and a simple definition. Here are some notebooking pages you could choose from to use. If you can’t do the experiment, here’s a video. Write a definition of chemical reaction. Watch this video of a neat chemical reaction. This is sulfuric acid being poured into sugar. Sugar is C12H22O11. Do you see that H22 and O11 could make 11 water molecules (H2O)? The acid reacts with the sugar causing the atoms to bond in a new way and the hydrogen and oxygen combine to make water (you’ll see it as smoke in the video). That leaves only carbon! You’ll notice the black carbon in the video! Read this page on flight and look at the images. What are two types of flight? How are airplanes similar and different from flying animals? Explain the different kinds of flight. Watch this video of the world record paper airplane throw. It starts falling but then goes up again. What’s happening? How is it flying? Read about the principles of flight. (*)Here’s a notebooking page if you want it. Read this page on forces in flight. *Make a paper airplane. Put a little hole in the middle of it. Pull the string through the hole so that half is up and half is down. Tape it in place. Lay the straw along the middle of it. If it doesn’t stick out both ends, cut it in half and tape each half so that each sticks out one end. Cut out these labels, flight forces, and tape them onto the string and straw. Here’s a completed plane. Here’s a picture as to where the forces go. We are going to learn about each of these forces in flight. Hang your plane somewhere if you can. The first force in flight we are going to look at is gravity. Now you are thinking, that’s not even on my airplane I made! It is, you called it weight. Gravity is what gives us weight. It is actually gravity pulling down on our mass that makes the scale go down showing how much we weigh. Your mass is how much matter you are made of. Gravity pulls on all mass with the same force. Gravity is always pulling everything at the same speed. Hold a small coin in the air. Let go. It fell right? Well, actually, gravity pulled it down to the earth. Now do the same with the bag of coins. Same thing? Now, your bag of coins should feel heavier than the one coin. Which will fall faster? Drop both at the same time. Did they hit the ground at the same time? Why? Because gravity is always pulling everything at the same speed. Now test a bunch of other things. Do you have a golf ball or tennis ball in the house? Try dropping other things together. Did you expect something dropped and something shot out to land at the same time? You are going to quickly hit the very end of the ruler that is hanging off the table. When you do that, you will be knocking it out from under the one coin so that it drops and you will be striking the other coin so that it flies off. Try it several times. On Day 34 we learned that gravity makes all masses speed up at the same rate. Gravity doesn’t pull at everything in the same way though. The more mass, the more gravity pulls on it, which is why we all weigh different amounts (even if we all fall at the same speed). Also, every object has a gravitational force. You have a gravitational force attracting everything to yourself! It’s such a tiny, itty, bitty force that it doesn’t really affect anything. The earth, since it’s so big, has a big gravitational force, which is what makes your ball fall down when you throw it and keeps you from floating away. Astronauts can float in space because they get too far away from the earth’s gravitational force. The don’t float right off the moon because it, like everything, has a gravitational force. The moon pulls things towards itself too. It’s big enough that its gravitational force keeps the astronauts from floating away. BUT, the moon is a lot smaller than earth so that its gravitational force isn’t as strong as earth’s. Watch this astronaut jump around showing that there is less gravity on the moon. For the next one skip to :45 and watch him jump two times. Does it seem like it’s in slow motion? He’s falling slowly because there is less gravity on the moon, less gravitational pull. You are going to fill in a worksheet that shows how much you would weigh on each planet. Each planet is a different size so it pulls down on your mass with a different amount of gravitational pull. Write your weight on earth in the box and use a calculator to multiply. *Print out this worksheet and use a calculator to fill it in. Explain to someone why you would weigh less on Venus. *Print out this page, read it and fill in the chart. Here’s a video of an astronaut falling “in slow motion.” He falls more slowly in space because the moon is smaller than earth, so it has less of a gravitational pull. His mass is the same, but his weight (gravity pulling on his mass) is different. He is pulled to the moon with less force than on earth since the force, the speed at which gravity pulls, is less. Makes it seem to us like it is slow motion. (*)Explain in writing how mass, weight and gravity are connected. Mass / Weight Notebooking Page. We learned about gravity which pulls airplanes down. Now we’re going to learn about the opposite, lift. It’s what lifts airplanes up. How does air keep up an airplane? Watch the video for the first three minutes. Take a strip of paper. Hold it up to your lips. Blow over it. Blow under it. When does it go up or down? Why? When you throw a frisbee, what is holding it up in the air? Does air pressure really hold things up? Stick a straw into water and hold your finger over the open end. Take the straw out of the water. Is the air holding the water into the straw? Yes! That’s air pressure at work and it’s very strong. Read this lesson on lift. You can try some of the suggested activities. Can air really hold things up? Do the experiment below. Experiment: fill a glass 2/3 full of water and cover with an index card (or cardboard or stiff paper). Hold the card in place securely and flip the cup over. Remove your hand. The 14.7 pounds per square inch of air pressure will hold the water in it’s place. Watch the video below on air pressure. Try this experiment: stretch a balloon over the opening of an empty 2 liter bottle. Place the bottle in a pan or bowl of super hot water. The air inside the bottle will heat and expand creating more air pressure. It will press on the rubber of the balloon and expand it a little. Place the bottle in a pan or bowl of ice water and the balloon will deflate. The air in the bottle will cool down and the air pressure will lower and stop pressing on the balloon. Try this experiment. Blow a ziplock bag. Seal it almost all the way. Give it another big puff and seal it closed. Put it in the freezer. Check on it in 10-15 minutes. Did it deflate some? Why? Air expands when it is hot, increasing the pressure it’s putting on the bag. Air pressure is lower when the air is cooler. *Fill out an experiment worksheet. Watch the video below on air pressure. (You can try it if you like.) Can you answer the questions? 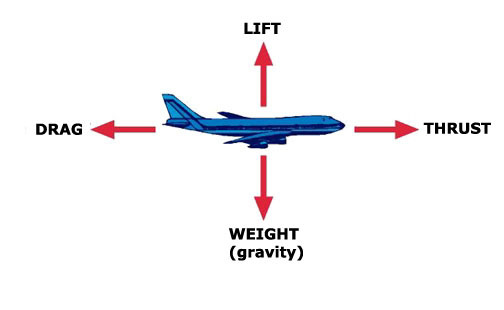 We’ve learned that lift is caused by creating high air pressure under the wings of the plane. The air lifts the plane up. A helicopter works in a similar way. The airplane drives forward pushing the air over and under the wings creating the change in pressure so it can lift off. A helicopter twirls its blades to move the air over them. 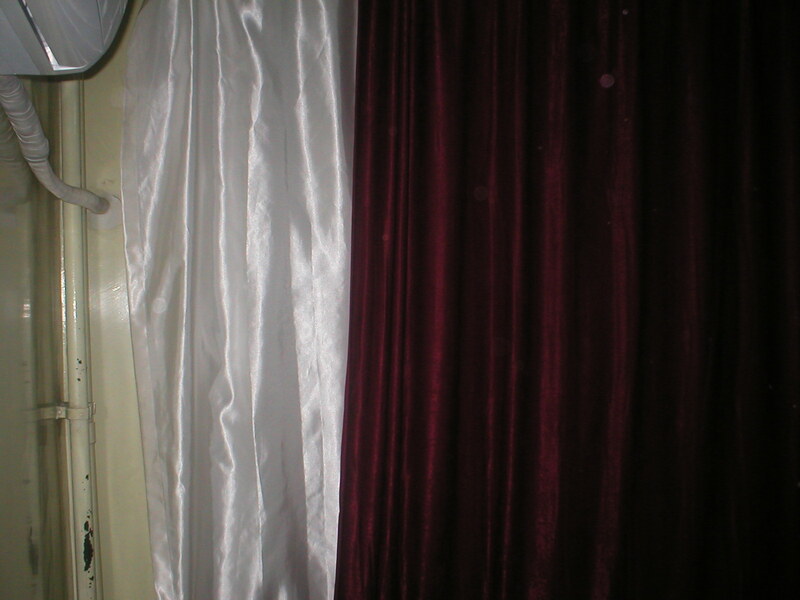 They are also creating higher air pressure under its blades which causes the lift. *Make a motor rotor. Use the template to make the paper blades. Tell how lift is created with your motor rotor. Tell how lift is created with your boomerang. Here is a youtube video with directions for an origami boomerang. Get permission before going to youtube. Do this experiment and read through the steps, questions and answers. Do the extra experiments if you like. Today you will learn about thrust, the push that moves the plane forward. Read through part 1. You don’t have to try the experiments, but you can. Build an engine (part 2 of the booklet). 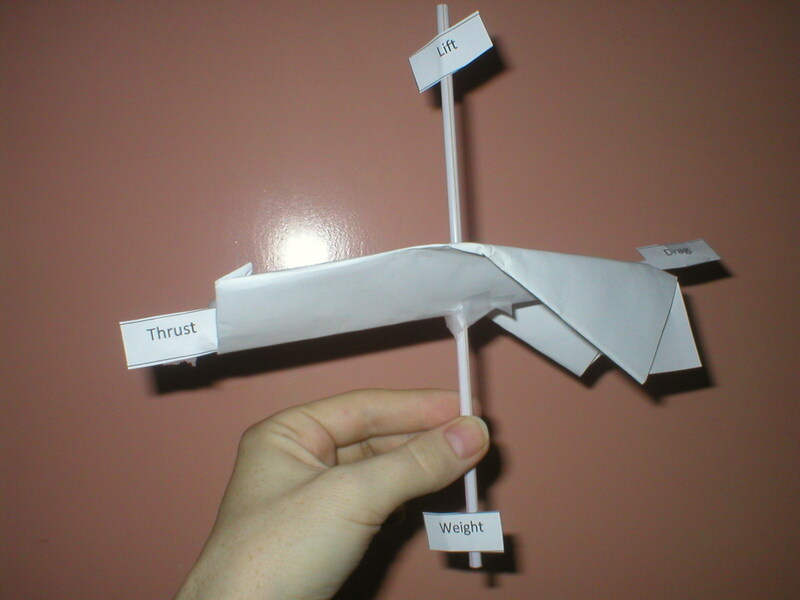 Review the flight forces: lift, thrust, weight, drag. Describe to someone each force and what it does. Do the activity on flight forces. Do you remember the four forces of flight? What are they? Build a glider. Read and follow the directions. Answer the questions. Experiment. Find the proper weight and balance. Build a glider. Read and follow the directions. Answer the questions. Experiment! Can you answer the first four questions? See if you can fly at all. Gain speed and then use the arrow keys (down!) to get into the air and then steer. Take this “Tour of the Basics” through page 15 and review Forces of Flight through page 45. Answer the questions the best you can to fly around the world. Watch the short Amelia Earhart movie. 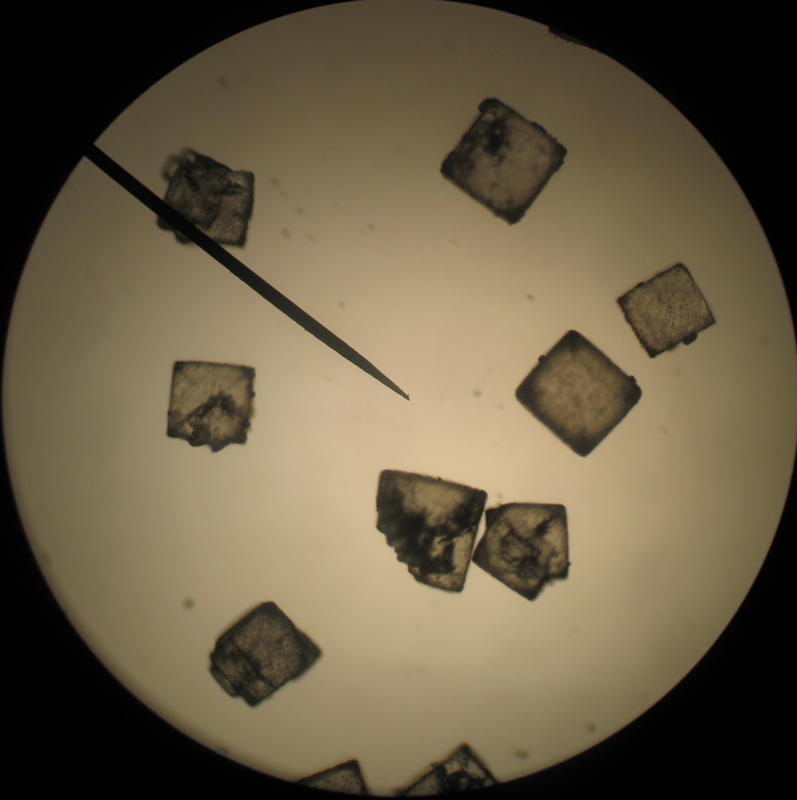 Cut out your sodium piece and add it to your Alkalai Metals Group lapbook page. Watch the short video on Amelia Earhart. Read about sodium. Use this link as well. Cut out your sodium piece and add it with your others. If you want, you can watch the sodium video. We’ve looked at chemical reactions, when there is a change in the chemical. Today we’re going to see what reacts with baking soda. Gather some supplies: ketchup, tomato juice, honey, water, lemon juice, mustard, pickle juice, orange juice, whatever else you want to try that you have in the house. Count up how many things you have. Get a cup for each one. Put some baking soda into each cup. Put some ketchup (or whatever) into the first cup and place the ketchup bottle behind the cup so you know what you put in that cup. *Record the reaction on your sheet, acid testing sheet. Take the quiz. It’s okay if you get some wrong. Read about the correct answer and try and understand. Write another definition of chemical reaction in your binder with your previous one. Help a parent make red cabbage juice indicator. Try the experiment. Get your disposable cups. Put a small amount of several different types of liquids in there. Hydrogen peroxide, window cleaner, water, vinegar, try some drinks from the fridge, egg white, whatever else you want to try (with permission). Always be SUPER CAREFUL when using cleaners. They can use powerful and harmful chemicals. Wear goggles and rubber gloves if you have them. Put a little indicator into each cup. If you can’t do this at home, here’s a video of setting up the experiment and the results. Read about acids and bases. Watch the movie on acids and bases. *Fill in this worksheet, acids and bases. You can check your answers on page 2. Use your paper to test a series of liquids in your home: cleaners, drinks from the fridge, egg whites, sauces, whatever else you can think of (with permission). Use goggles and rubber gloves if you have them. Dip the test paper into each one. If you can’t do this at home, here’s a video of a similar experiment. Play at the juice bar. Do the first challenge. 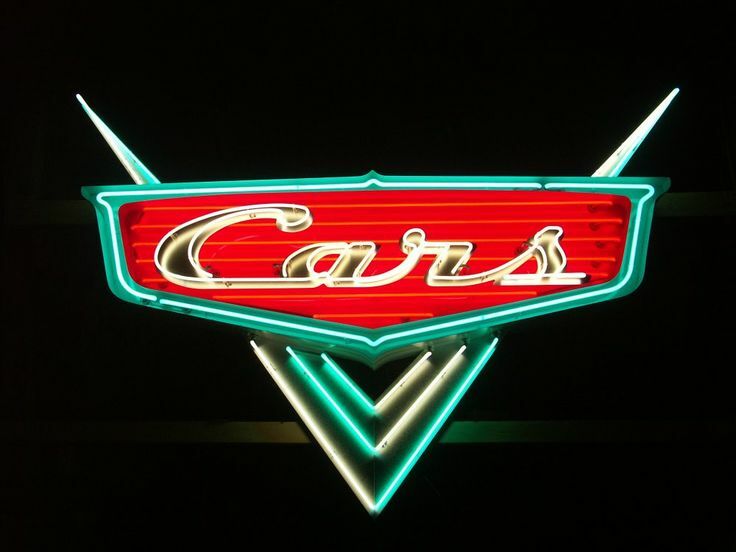 Read about neon. You see neon in many lit up signs. Cut out your neon piece. Draw or write inside and add it to your Noble Gases lapbook page. Play at the juice bar. Do all three challenges. Read about neon; read here too. Cut out your neon piece and fill it in and add with your others. Do the second and third challenge at the juice bar. Watch this video on fireworks. Explain to someone how a firework works. Read this and do the experiment (needs to sit for three days). You are going to keep reading about chemical reactions. I know this isn’t easy stuff. Take your time and get what you can from it. Do concentration, temperature and pressure contribute to the reaction? How? Pour a cup of soda. Place the cup on a tray or in a bathtub or sink. Add a lot of salt (1/4 at least), but you could try it with differing amounts. Observe. Read and watch the Diet Coke and Mentos experiment. These both work the same way. The salt and Mentos attract the CO2 (Carbon Dioxide–what makes the bubbles in a fizzy drink) and pulls it all out of the soda at once instead of little by little like it usually comes out. Here’s another page on chemical reactions. Let’s combine reactants to make a new product! If you can’t do it, here’s a video to watch. The experiment in this link was done with borax which is a type of laundry detergent. Listen to the explanation. Read this page and do the experiment. Take your chicken bone out of the vinegar and try and put it in a shape. Leave it out to dry and absorb the carbon dioxide from the air you breathe out. Find someone else and act out being their catalyst and inhibitor. Do this experiment. The yeast is the catalyst. If you can’t do it, watch this video. Watch these cool chemical reactions. Some of the videos are missing. *Check on your chicken bone. Fill in this worksheet, Knotted Bones. What was removed from the chicken bone? *See how much of this chemical reactions worksheet you can fill in as you watch the video. Just print pages 1 and 2 and stop the video when it gets to the quiz. You can check your answers on pages 3 and 4 when you are finished. Watch the top ten chemical reactions. 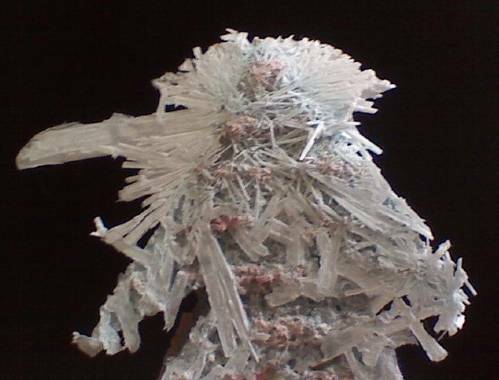 Magnesium is a metal and is found in the earth’s crust and in seawater. It is used in building airplanes. Cut out your magnesium piece and fill it in and add it to your Alkalai Earth Metals lapbook page. Watch the video on magnesium. Read about magnesium: here and here. Cut out your magnesium piece and fill it in and add it to your collection. We’re going to go back and look at the different states of matter. Specifically we’re going to look first at solids. Tell someone what makes something a solid. We’re going to go back and look at the different states of matter. Specifically, we’re going to look first at solids. Read about solids, liquids and gases and look at the pictures of how the molecules (or particles) behave in each. Read through pages 1, 2, and 3. A soda or pop bottle has a solid, liquid and gas. Describe to someone the three states of matter in a bottle. What happens when you tip the bottle? What type of matter is affected? What happens when you open the bottle? What type of matter is affected? Take a bottle in front of an audience and answer these questions with a demonstration. Want to check out my son’s MoonScrapers? They combine a liquid and solid to make a gas. Today you’re going to read about gases. Want to check out my son’s MoonScrapers? They combine a liquid and solid to make a gas. When the gas fills the space, pop! Now we are going to be looking at liquid. You have learned how liquid moves and fills containers and can’t really be compressed (or pushed down) much. Viscosity is the measure of how a liquid flows. Actually, it measures how much it resists flowing. Liquids move right? You put them in a container and they spread out and fill it. If you poured water in a bowl, it would spread out quickly and fill the space. Water has low viscosity. Honey you got from the fridge and poured into a bowl has a high viscosity. It resists flowing. It moves slowly. Today you are going to read about liquids. Do you remember yesterday’s big word? Viscosity. A liquid’s viscosity can change. If you heat up honey, it would get less viscous and flow more quickly. Today you are going to change the viscosity of a liquid with force. Combine 1/2 cup of cornstarch with 1/2 cup of water, slowly adding the water in until it stirs like a stiff liquid but feels like a solid when tapped. When you push on it, does its viscosity get lower or higher, does it flow more easily or not. You can see it in the first minute of this video. Yesterday you were introduced to viscosity. Do you think temperature would affect the viscosity of a liquid? (Hint: consider honey cold and hot) Test your hypothesis, test a liquid at two different temperatures to see if its viscosity changes. Cut out and draw/write inside your aluminum piece. Add it to your Boron Group lapbook page. Watch the video on aluminum. Cut out and write inside your aluminum piece. Add it with your others. It is in the Boron Group, Group 13. Combine the three liquids two at a time. Make sure you know which liquid you put in first and second. Put the first liquid in. Then slowly put in the second. Does the second sink through the first or sit on top? If it sits on top, it is less dense. If it sinks, it is more dense. Make a list of your liquids from the most dense to the least dense. Now pour them all into the jar slowly, one at a time, the most dense first, the least dense last. You can test another liquid and try and make a taller tower of liquids. Get a tall glass or jar that you can see through or a skinny glass flower vase would work well. Put the most dense on the bottom, then the next and so on. If there is more than one clear liquid, color one with food coloring. Here’s a video of an experiment like this. *Do the first page of this density worksheet. You can use a calculator. Density = Mass (grams) / Volume That means that means that Volume = Mass / Density and also that Mass = Density * Volume. Check your answers on page 2. Play with this buoyancy explorer. Buoyancy is the ability something has to float. If something is buoyant, it can float. If you want to hear this word read to you, click on this and then the little speaker icon next to the word. Something is buoyant, or can float, if it is less dense than water. *Try out things from your home. Fill a bowl with water and drop things in. Check off on your list if they are buoyant or not. You may be thinking, don’t people sink? Water’s density is 1. Salt water’s density is 1.025. The average human body’s density is 1.01. Can you see why people can float and sink? Capillary action is water being drawn along a solid. It happens because the molecules of the liquid are attracted to the molecules of the solid and that pulls the liquid along. Read and do this experiment to see it in action. Draw pictures to define the terms we’ve learned – Properties of Water. Read about silicon. The circuits in your computer are made from silicon. Cut out your silicon piece and draw/write inside of it and add it to your Carbon Group lapbook page. Present your experiment. You could make a video, a poster, a book or use this experiment book to write and draw in for your project. Here’s an experiment that is exothermic. What is that? It gives off heat. Chemical reactions create different products. Some reactions create energy, heat! Go to the link to see the experiment, Hot Ice, and to try it. Explain to a parent what exothermic means. *Print out this worksheet for the experiments. An endothermic reaction is one where the temperature lowers. While you are eating, tell someone the difference between an endothermic and an exothermic reaction. Cut out and fill in your chlorine piece and add it to your Halogens lapbook page. Do you remember what element the C is the symbol of? If not, go look on your periodic table . O2 shows dioxide. “di” is latin for two. CO2 is the chemical compound released when you mixed baking soda and vinegar. Baking powder is an acid and a base together. (vinegar is an acid, baking soda is a base) You can make something similar by combining the base, baking soda, with the acid, cream of tartar. When you add any liquid to baking powder, it causes the acid and base to react, and CO2 is made. The gas bubbles get caught in the batter or dough you are making and fill it with gas. This filling is what we call rising. Put a spoonful of baking powder in a small amount of water and watch what happens. Bake some quick bread. Don’t stir too much or you will release all the gas! Draw a diagram of anything you get to work. *Write an experiment report — Y4sM Day 75. Here is an electricity video to look at to get you started learning about electricity. Here’s some information you could include. You don’t have to use every bit of information! Connect two alligator clips to a 9 volt battery, one to each terminal (part sticking out). Connect the other end of each wire to a little light bulb. This is a closed circuit. When you detach one wire. This is an open circuit. Read pages 4 and 5 about series and parallel circuits. Do this static electricity experiment. Watch this video on static electricity. Here’s the same lesson that you can read. *Complete this safety worksheet. The answers are on page 2. Here’s an activity to learn about electrical safety in your home. *Look up definitions for the words and write them in the light bulbs. Try and build this experiment. A dry cell is just a regular battery like A and 9 volt batteries. You can use aluminum foil for your switch. *Fill out this experiment worksheet. You created a magnet. Now let’s learn some more about magnets and magnetism. We think of magnets as being what’s on the refrigerator, but really magnets and electricity go together. *Fill out this worksheet with things you’ve learned. *Today do the magnet vocabulary. You may search online for the definitions or use a dictionary. *Fill out this worksheet. You can check your answers on day 2. If you need help, you can use this link. *Complete this worksheet on electromagnetism. *Complete this worksheet. You can check your answers on page 2. You can see what grippers are, using magnets for lifting. You can watch the video in the row of pictures. *Draw a gripper in action. What can you think of or what can you find in your house? Here’s a link about where magnets are used in your home. Take a picture of your lapbook or put the whole thing in your portfolio. *Take notes on this page as you learn about the earth’s magnetic field. Read this page and try the experiment. The video on the page isn’t working, but here it is from youtube. Explain how electrons and magnets can work to make things rotate. Draw a picture that explains how magnets work. Magnet activity Click on the activity on the right. Draw a circuit with a battery, a light bulb and two wires. (If you need a circuit review, play this.) Make sure it is a closed circuit. Electricity has to flow. It can’t just travel from the battery to the light bulb; it has to be able to flow back through the battery. Now draw a circuit with a battery, a light bulb, a switch and three wires. Build the circuit. You can use aluminum foil and paperclip for your switch. Fold a piece up into a small rectangle. Clip one end into one of the wires. Clip the paperclip into the other wire. What happens when you press down on the aluminum foil to touch it to the paperclip? It should turn on the light. If for some reason you can’t build circuits, you can do this little circuit course for the next few days. You can do it just for fun too. Build a simple circuit with one battery and one mini lightbulb (or something similar). Add in an extra wire on one side to make the wire on one side extra long. Try each one in between the two wires on the long side of the circuit. *Fill out this experiment worksheet on which ones conduct or carry electricity. Water conducts electricity very well which is why you have to get out of a pool during a lightening storm and why you should never be in the bath when there is an electrical item plugged in near you. What difference does changing the power source (here it’s a battery) make? Guess whether each item will be a conductor or not before you try it. Were you right? Watch this video on circuits and human conductors. Why not try and make a circuit with you in it! Today you are going to test for ability to dissolve or disappear into a liquid. Take a clear cup and fill it halfway with cold water. Take a regular spoon and fill it with one of your test items. Dump it into the water and stir. Did it disappear into the water? Did it dissolve? *Mark it on your worksheet. We already know sugar dissolves in water because we stir it into our tea — hot and cold. *Write the definitions for all the words that are a different color. (Put your mouse on the words and a definition will pop up.) Fill in today’s words and then save the page. Today you are going to test to see if temperature effects the ability to dissolve. You already tested these items in cold water and saw them dissolve (except for sugar). Heat up one cup of water on the stove. Stir in a spoonful of one of your test substances. Did it dissolve more easily or with more difficulty than when in cold water? *Record your observations. Does it dissolve in hot water? Go ahead and mix sugar in cold water to compare the two. Write a sentence describing your conclusion about how temperature effects how things dissolve. Write all the colored words’ definitions on your saved page. Today we are going to find the solubility of salt. That means we’re going to see how much salt we can dissolve into a liquid before it just can’t hold anymore. Did salt dissolve better in hot or cold water? Put one cup of water in a small pot. Stir in salt one tablespoon at a time until it is dissolved. Keep track of how much you are putting in. When you can’t get any more dissolved, the water is saturated; it can’t hold any more. The salt water is called a saturated solution. Heat up the salt water in the small pot. Add in more salt a teaspoon at a time and stir until dissolved. Keep track of how much you are putting in. Stop when there are a few grains of salt in there that just won’t dissolve. The quantity of salt you put in is its solubility in hot water. What is it? The water is now a supersaturated solution. It’s completely full and will be too full when it cools. Soak a piece of cardboard in your supersaturated solution. Set it on a plate in a sunny place to dry. What happens? What happened to the salt water in your pot when it cooled? Tell someone all about saturated solutions. Write the definitions on your page. Draw a picture of making a saturated solution with salt and water. Label the water with this word, solvent. Label the salt with this word, solute. The solute is what dissolves in the solvent to make a saturated solution. Do you know what is a solute and what is a solvent? Watch this video on a saturated solution. We’re going to do some more chemistry review. Let’s go back and look at atoms again. Remember they have neutrons and protons in the nucleus and electrons in the outer shells. The electrons have a negative charge and the protons have a positive charge–like magnets and electricity. We’re going to go back and look at atoms and molecules again. An atom is made up of three particles: protons +, electrons – and neutrons. The positively charged protons are attracted to the negatively charged electrons. The neutrons have no charge and are neutral. There is always the same number of electrons as protons in an element. The protons and neutrons are in the center of the atom, called the nucleus. The electrons spin around the nucleus in an orbit. Their opposite attraction (like magnets) keeps the atom together. Build atoms. You only have 5 minutes. Click on all the boxes to the right. Create different elements by adding protons, neutrons and electrons using the arrows on the left. Keep the number of the particles the same–same number of electrons and protons. *Label the drawing of an atom on page 1. Do you need a helping picture? Write the name of this atom — which has 2 electrons? What do you remember about atoms? Page 2 has the answers. Atoms make up everything in our world. When atoms come together and bond or attach to each other. They make molecules. H2O is a water molecule made up of two hydrogen atoms and one oxygen atom. Build molecules. Use the model mode to attach atoms together or look at how atoms are linked in real molecules. Heat up the molecules to get them moving to turn the solid into a liquid and then a gas. Build water molecules with gummy candy and toothpicks. Two hydrogen (same color) and one oxygen (different color). Here’s a picture. Now make 4 more water molecules. Now attach them all together. The hydrogen needs to attach to the oxygen. Here’s a diagram–scroll down, 3rd picture from the bottom. This is how drops of water are formed and hold together. Use your candy to build a model like described on page 3 of this pdf. Use one color for positive and one color for negative. Play this atoms game. Can you figure out the puzzle and connect two hydrogen atoms and the oxygen atom to make a water molecule? *Print and complete pages 1 and 2. When you are finished, check your answers on pages 3 and 4 and make sure you understand. Describe to someone or draw a picture about how when forces are equal on an object they stay the same but when one is larger the force moves the object. Play this game. Weight provides the thrust when you combine it with the hill. Drag is created by the parachute. How do the forces work together and against each other. After you play the game, tell someone how to make the car go farthest and how to make it go the shortest distance. Here’s a little reminder about gravity. Read pages 1 and 3 of this pdf. Watch the video on friction. You can play with larger and smaller forces here. Leave it set to net forces. *Read and fill in pages 1 and 2 of this worksheet. You can do this. It’s a diagram of your two hands pushing against each other. Your left hand pushes and your right hand pushes more. Which way do your hands move? Do they move more when you push harder? Yes. That’s all these diagrams are showing. Check your answers on pages 3 and 4 when you are finished. 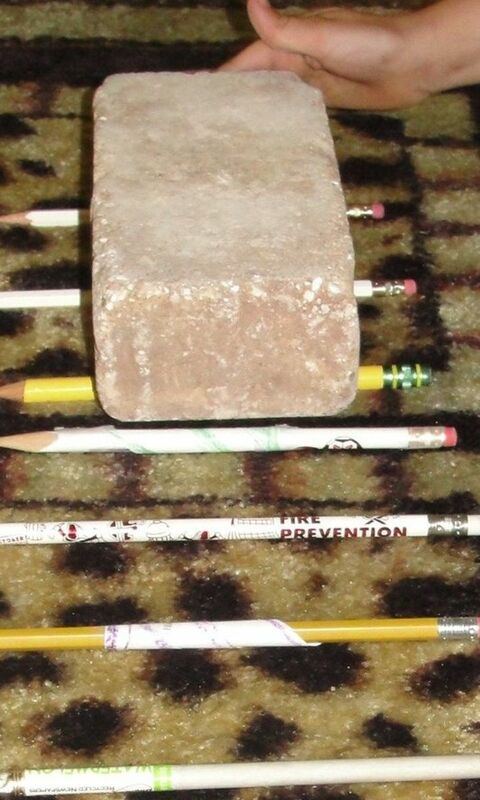 *Fill in this worksheet on different things that cause friction. Friction helps us walk, but it makes moving heavy furniture across the room harder. List examples of friction and decide if it is helpful or not. Can you image a world without friction? What if you plopped yourself down on the couch and it slid across the room? What else would happen if there were no friction? Play with friction. Choose friction. In the box on the right add or remove friction. Read about potassium. Read more about where to find it. Fill in your potassium mini book. (Eat a potato or banana 🙂 ) Add it to your Alkalai Metals Group lapbook page. Read the first page on this site about Newton’s First Law of Motion. Watch the first video, then build a catapult to demonstrate this law. Get permission before you stick thumbtacks into something. Watch the second video and explain how it demonstrates Newton’s First Law of Motion. Read about Newton’s Second Law of Motion. Demonstrate this law. Find two things of unequal weight. Push them the same speed across the floor. Which one did you need a greater force to push? The heavier one because force equals the mass times acceleration. That means, the heavier the object is, the more work it will take to get it going. If you have chairs you can slide on a floor, push an empty chair and a chair with someone sitting in it. The one with the greater mass (the heavier one) will be harder to push. If you are really excited about this, figure out your acceleration by figuring out how many meters you go in 1 second. That’s your acceleration. Acceleration is measured in meters per second (m/s). Weigh the object you pushed. That’s the mass. Mass is measured in kilograms (kg). Use an online converter to figure out kilograms if you need to. Multiply the mass and acceleration (use a calculator) to find out the force you used. Force is measured in Newtons. Guess why they are called Newtons? Explain how does this video show the first law of motion. Read about Newton’s Third Law of Motion. Think of a way to demonstrate Newton’s Third Law. Here is an example, and a second one. The video from day 39 is also an example. Explain how each example shows Newton’s Third Law of Motion. *Fill out this worksheet on the laws of motion. Cut out and fill in your calcium piece. Add it to you Alkalai Earth Metals lapbook page. Make sure your book on Newton’s Three Laws of Motion is finished. Take the quiz. Did you know the answers? You can click on Answers to see if you were right. *Match the laws to the examples. The answers are on page 2. Build a hovercraft and demonstrate the three laws of motion. (You can use tape instead of super glue. Just seal it all the way around. No air can escape.) Demonstrate to your parents and show them each of the three laws of motion in action. Design a roller coaster. Then click on park map and try the other rides. Keep your momentum to reach the goals. Cut out and fill in your iron piece. Add it to your Transition Metals lapbook page. Cut out and fill in your iron piece. There are seven simple machines. These machines help us do our work. The work these machines help us do is moving a mass over a distance. What is something in your house that is too heavy for you to lift? These machines would help you move that item. 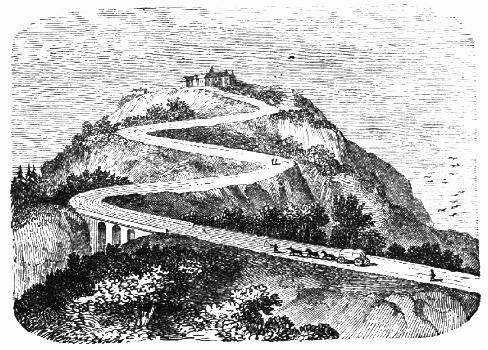 The first one you are going to learn about is the inclined plane. Watch this video about the inclined plane. Look at this picture. Explain how this inclined plane make the work of getting the cart up the hill easier? *Draw a picture of an inclined plane on this page. Save the page for the coming days. The next simple machine we will learn about is the wedge. A wedge is like an inclined plane. It is slanted and comes to a point. The difference is that an inclined plane stays where it is put. The wedge does the moving. It is used to split things apart. Can you find the wedges in these pictures? Watch these two short videos which each give an example of a wedge: one two. Have your mother show you one of her big knives. Is it thin on the cutting edge and comes to a point? It’s to wedge into whatever you need to cut. Draw a picture of a wedge on your simple machines paper. The next simple machine is the lever. Can you pick up another person as high as your head? You can with a lever. Watch the video to see how. Try pushing open a heavy door from the edge near the door knob and from the opposite edge. Which is easier? Why? 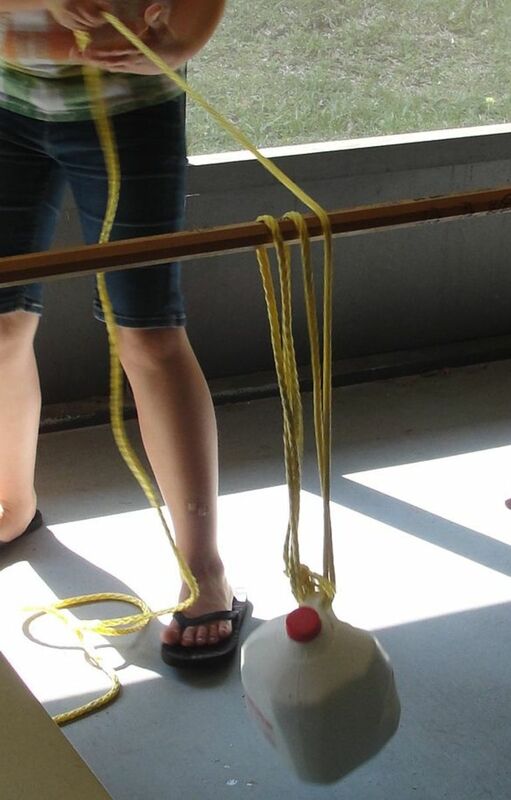 Add a picture of a lever to your simple machines page. Today’s simple machine is the screw. Watch this video and explain how the screw is like an inclined plane and how it helps her move the water. Add screw to your graphic organizer. Watch this video showing how a screw can help move things. Cut out and fill in nickel piece. Add it to your Transition Metals lapbook page. Watch a video about nickel. Cut out and fill in nickel piece. Today’s simple machine is the wheel and axle. Think of different wheels in your world. Wheels don’t just help carry things. Do you have a pizza cutter in your house? Another tool built like a pizza cutter (but without the sharp edge) is a surveyor’s wheel, measurement tool. Build a surveyor’s wheel. 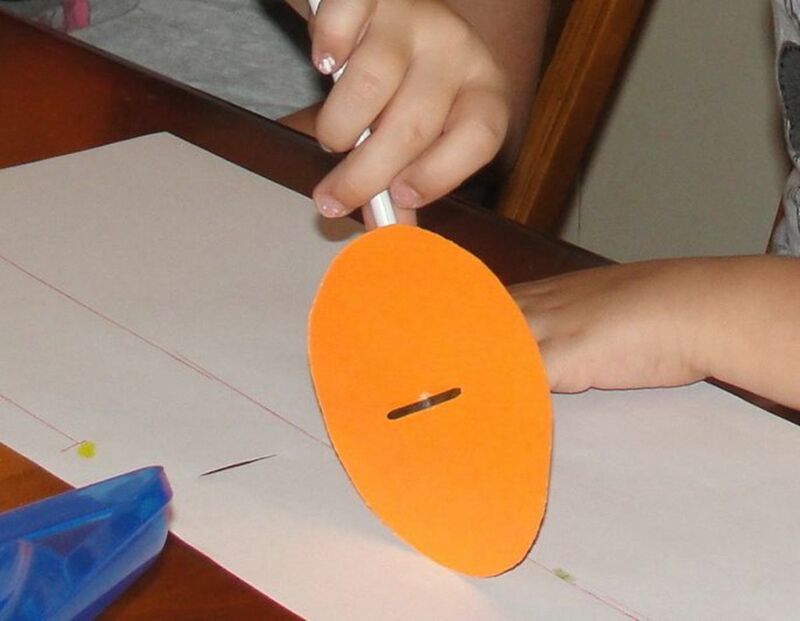 Cut a circle out of thin cardboard or card stock. Attach it to a straw with a brass fastener. Mark a spot on the circle. Put the spot on the edge of a piece of paper. Turn the wheel around one time. Measure how far it traveled. A real surveyor’s wheel would click each time it made one turn. If it traveled one meter each turn and clicked 25 times, then the surveyor would know that the distance was 25 meters. Why is that better than using a meter stick? The axle on your surveyor’s wheel was very small. It was the brass fastener. Watch this video demonstrating wheels and axles. Fill in the wheel and axle piece on your simple machines paper. Today’s simple machine is the pulley. Watch this video on pulleys. It has some big words, but you will see how pulleys work. Add a picture of a pulley to your simple machines paper. Ask a parent to put your simple machines paper in your portfolio. We’re going to look at one more simple machine even though your paper is full. This is not always listed as a separate simple machine. It is a type of wheel. It’s the gear. Gears have teeth the interlock . The big gear turns a smaller gear. You turn the big gear around once, and it turns the little wheel lots of times. Watch this video on gears. Watch this Bill Nye video on simple machines. Take the simple machine quiz. Cut out and fill in your lapbook piece. Add it to your Transition Metals lapbook page. Learn about machines. First go to the house. Then stop by the tool shed. First stop by the House to practice identifying simple machines. (requires Flash) If the House link doesn’t work for you, please click here first to log in and then come back and click the House link. Look at how important it is to build your bridge right! Here’s a physics failure bridge! Gather materials for building a dome on day 142, either newspapers or gumdrops and toothpicks. Level 1-4/5-8 Build a dome. Use either newspapers or gumdrops and toothpicks. Here’s a youtube video of a newspaper dome; get permission before you watch a youtube video. Note: The directions on the youtube video are a little off. It should be 71 cm and 63 cm. L/M Do this straw activity and then build a skyscraper out straws. Cut out and fill in your lapbook piece. Add it to your Halogens lapbook page. Cut out and fill in your lapbook piece. Add it to your Transitions Metals lapbook page. Tell your observations to your parents. Play this roller coaster game if you can’t build one. Here’s one that’s not a game but gives the science behind it. Draw a diagram of your (a) roller coaster. Put numbers on your diagram to show where the roller coaster was fastest and slowest. Write a 10 for the fastest and 1 for the slowest. Mark other places with 5, etc. How did the fast places help in the slow places. Explain to a parent how speed and how high your roller coaster was effected how your roller coaster worked. Energy comes in lots of different forms. One form is heat. Watch this video on heat energy. Put two jars of water out in the sun (or glasses). Make sure they have the same temperature of water in them. If you have a thermometer, measure the temperature of the water and record it. Wrap one jar in white paper. Wrap one jar in black paper. Where did the heat come from? Draw a diagram that shows something on earth heating up due to radiation from the sun. Read about heat transfer — heat moving from one thing to another. Draw a picture of an ice cube in a glass of water. Use arrows to show that the heat is leaving the water and going to the ice. That’s what is making the ice melt. The water cools down because its heat energy is leaving. Make sure you put your picture in your binder. Yesterday you read about conduction, when heat transfers from one object that is touching another object. Read about convection, another way heat is transferred. Try this convection experiment. Make it full screen to block out everything else. Put on a science show about heat. Use your diagrams to teach your audience about the three different types of heat transfer. Quiz your audience to see if they learned what they were supposed to learn. Review the three types of heat transfer. Put on a science demonstration. Teach your audience about the three different types of heat transfer. Demonstrate them with visuals or by acting out what happens. Be creative. Be informative. Quiz your audience afterwards to see if they learned what they were supposed to learn. Cook pizza using the sun’s radiating heat. The other day we used the sun as energy to cook. The earth is full of natural energy. People have been working to use this natural energy. One way that’s been around for a long time is the water wheel. It uses the power of the water to do the work. Instead of burning coal to create steam to turn a magnet to create electricity. You can use a river’s water to turn a water wheel, which can turn a magnet to generate electricity. Watch the video (at least part of it). We can also use the power of waves and wind. Here are two little games to play just for fun to teach you about the different types of energy resources. Renewable means they can be used again. The wind and water never go away. Non-renewable means they get used up and are gone. Coal is non-renewable. Learn about how renewable energy is used. *Print out these elements cards. Play Go Fish. You only need 3 of each to get a set. Ask for the name, the symbol or any other info on the card to help you learn more about them. Your job for the last fifteen days of school is to make a science project. I recommend you pick a topic that you can use for your history project as well, and even English. That way you’ll become an expert on the subject. The Panama Canal is one suggested topic. You could build a working model of a canal. On the history page on day 166 I listed some other ideas. *You also have to conduct at least one experiment related to your topic. If you can, do the experiment in front of the group. If you can’t, explain the experiment and results. Here is an experiment worksheet you could use. *Do some research and learn about the science aspects of your topic. How does it work? Here are Research Note Taker sheets. *Keep working on your project. Print out this End of the Year Project checklist to make sure you are thinking about everything that needs to be done.